Kenny Roberts career took a road that we will find as we go along here. He was born in Lenox City, Tennessee. 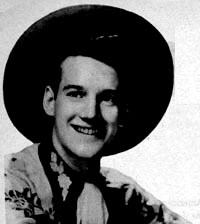 In mid-1949, Kenny signed a recording contract with Coral Records, a division of the Decca record label. His first release was an immediate smash, a tune called "I Never See Maggie Alone". The song was actually written in published back in 1926 and Kenny did a modern rendition of it that obviously got the listeners attention. 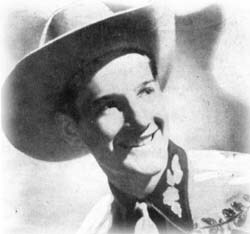 And he followed that hit recording up with tunes such as "River of Tears", "I've Got The Blues", "Yodel Polka" and "Hillbilly Style". He started in music at an early age. When he was just eleven years old, he organized a band that was made up entirely of young harmonica players. Around that time, he started to take up guitar playing. Later on, he learned the bass fiddle and violin, too. From Tennessee, his childhood took him to the New England area where we have few details. But, when he was just 16, he broke in to the radio business. About a year later, he left home to work in a lumber mill and then moving to a New Hampshire radio station. No sooner had he gotten there did he win out over 38 other contestants for the title of "Easter States Yodeling Champion". And yodeling would become one of his trademarks. 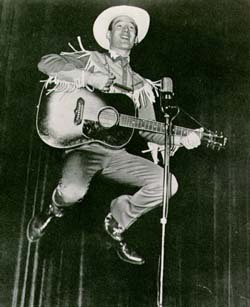 Kenny was not only a good singer, who made good records, but he was a good entertainer when he got in front of the audiences. He was booked at shows at such venues as the amusement parks in Ohio, Kentucky, Indiana, Pennsylvania, the New England area, Illinois, Missouri and many southern states. And from those appearances, he would get many return engagements. He not only yodeled but was a bit of a jumper while doing his tunes, too. He was quite a hit with the younger kids with his yodeling, jumping cowboy tunes. By 1953, he had returned to the Cincinnati area, and had a television show that was on from 5:00 to 5:45pm over WKRC-TV, but the show originated from WHIO-TV in Dayton. He first caught media attention when he was at WLW-T.
As time went by after he left WLW-T, he kept on going and improving as time went by. Folks who turned in to Arthur Godfrey's CBS network programs would be able to hear that talent for themselves. He was known as an 'exceedingly wholesome chap both on and off tv" and had an easy going nature with children, perhaps as a result of being a father to his three young sons back then. The new Cincinnati show he was doing over WKRC had a mixture of entertainment. There was a hayseed comedian, 'a singing, instrumental trio of clean-cut lads in cowboy outfits', and a puppet named "Windy", who was a lovable character that wore a Mexican sombrero. Now they say that "Windy" was known to tell a little fib now and again. But it seems everytime he did that, his nose would give him away as it would "balloon" in size. Kenny would keep a tab on Windy's fibs and if it got to be about ten fibs, why, wouldn't you think the nose would 'balloon' to such a size it would explode? 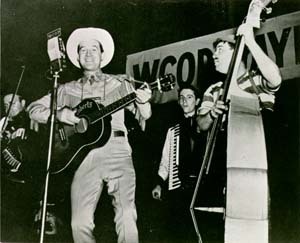 Kenny's career saw him make stops at such places as the Hoosier Hop that was out of Fort Wayne, Indiana as well the WCOP Hayloft Jamboree. We'll be updating this story as we go along. Cowboy Songs Magazine No. 25; March 1953; American Folk Publications, Inc.; Derby, CT.